Purpose: To evaluate advantages and disadvantages of identical implants with internal or external connections. Materials and methods: One hundred and twenty patients with any type of edentulism (single tooth, partial and total edentulism), requiring one implant-supported prosthesis were randomly allocated in two equal groups to receive either implants with an external connection (EC) or implants of the same type with an internal connection (IC) (EZ Plus, MegaGen Implant, Gyeongbuk, South Korea), at four centres. Due to slight differences in implant design and components, IC implants were platformswitched while EC were not. Patients were followed for 5 years after initial loading. Outcome measures were prosthesis/implant failures, any complication, marginal bone level changes and clinician preference, assessed by blinded outcome assessors. Results: Sixty patients received 96 EC implants and 60 patients received 107 IC implants. Three patients dropped out with four EC implants and five patients with ten IC implants, but all remaining patients were followed up to 5-year post-loading. One prosthesis supported by EC implants and two by IC implants failed (P = 0.615, difference = -0.02, 95% CI: -0.08 to 0.04). One EC implant failed versus three IC implants in two patients (P = 0.615, difference = -0.02, 95% CI: -0.08 to 0.04). Ten complications occurred in 10 EC patients versus nine complications in 9 IC patients (P = 1.000, difference = 0.01, 95% CI: -0.13 to 0.15). There were no statistically significant differences for prosthesis and implant failures and complications between the different connection types. Five years after loading, there were no statistically significant differences in marginal bone level estimates between the two groups (difference = 0.14 mm, 95% CI: -0.28 to 0.56, P (ancova) = 0.505) and both groups lost bone from implant placement in a statistically significant way: 1.13 mm for the EC implants and 1.21 mm for the IC implants. Two operators had no preference and two preferred IC implants. Conclusions: Within the limitations given by the difference in neck design and platform switching between EC and IC implants, 5-year post-loading data did not show any statistically significant differences between the two connection types, therefore clinicians could choose whichever they preferred. Purpose: To evaluate the outcome of two (fixed-on-2 = FO2) versus three (fixed-on-3 = FO3) implants placed flapless in fully edentulous jaws and immediately restored with metal-resin screw-retained crossarch prostheses. Materials and methods: Forty edentulous or to be rendered edentulous patients (20 in the maxilla and 20 in the mandible) were randomised to the FO2 group (20 patients: 10 in the maxilla and 10 in the mandible) and to the FO3 group (20 patients: 10 in the maxilla and 10 in the mandible) according to a parallel group design. To be immediately loaded, implants had to be inserted with a minimum torque of 60 Ncm. Outcome measures were prosthesis and implant failures, complications and periimplant marginal bone level changes evaluated up to 1-year post-loading. Results: Flaps were raised in four patients and two prostheses were loaded early at 8 weeks in the FO2 group. One year after loading no dropout or implant failure occurred, however one FO2 maxillary prosthesis had to be remade because of repeated screw-loosening (risk difference = 0.05; 95% CI: -0.05 to 0.15; Fisher's exact test P = 1.000). Three FO2 patients were affected by complications versus five FO3 patients (risk difference = -0.1; 95% CI: -0.35 to 0.15; Fisher's exact test; P = 0.695). There were no statistically significant differences for prosthetic failures and complications between groups. There were no statistically significant differences for marginal peri-implant bone levels between the two groups (estimate of the difference = 0.031 mm; 95% Cl: -0.22 to 0.28; P (ancova) = 0.803), with both groups losing marginal bone in a statistically significant way (0.27 mm for FO2 patients and 0.24 mm for FO3 patients). Conclusions: These preliminary results suggest that immediately loaded cross-arch prostheses can be supported by only two or three dental implants at least up to 1-year post-loading. Longer follow-ups are needed to properly evaluate both these therapeutic options. Purpose: To compare the outcome of immediately loaded single implants with a machined or a roughened surface. 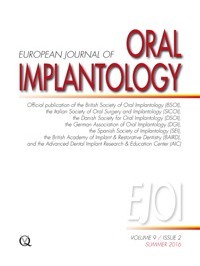 Materials and methods: Fifty patients had two implant sites randomly allocated to receive flaplessplaced single Syra implants (Sweden & Martina), one with a machined and one with a roughened surface (sand-blasted with zirconia powder and acid etched), according to a split-mouth design. To be loaded immediately, implants had to be inserted with a torque superior to 50 Ncm. Implants were restored with definitive crowns in direct occlusal contact within 48 h. Patients were followed for 6 months after loading. Outcome measures were prosthetic and implant failures and complications. Results: Two machined implants and four roughened implants were not loaded immediately. Six months after loading no dropout occurred. One implant loaded late, which had a rough implant surface, failed 20 days after loading (P (McNemar test) = 0.625; difference in proportions = -0.04; 95% CI: -0.15 to 0.07). Three crowns had to be remade on machined implants and four on roughened implants (P (McNemar test) = 1.000; difference in proportions = -0.02; 95% CI: -0.12 to 0.08). Three machined and five roughened implants experienced complications (P (McNemar test) = 0.625; difference in proportions = -0.04; 95% CI: -0.15 to 0.07). There were no statistically significant differences between groups for crown and implant losses as well as complications. Conclusions: Up to 6 months after loading both machined and roughened flapless-placed and immediately loaded single implants provided good and similar results, however, longer follow-ups are needed to evaluate the long-term prognosis of implants with different surfaces. Purpose: To evaluate the clinical outcome of two implants placed flapless in fully edentulous mandibles and immediately restored with metal-resin screw-retained cross-arch prostheses 5 years after loading. Materials and methods: Eighty consecutive patients were recruited. To be immediately loaded, implants had to be inserted with a minimum torque of 80 Ncm. Forty-six laser-welded titanium and 34 cast silver-palladium frameworks with resin teeth were initially delivered within 8 and 48 h, respectively. Outcome measures, evaluated by two independent assessors included prosthesis and implant failures, complications, marginal bone level changes, implant stability quotient (ISQ) values and patient satisfaction. Results: Five years after loading one patient did not return to the control and 10 prostheses were remade. Two implants failed early in two patients, but they were successfully replaced. Thirty-six complications occurred in 28 patients but were all successfully treated. After 5 years, mean marginal bone loss was 0.69 mm, mean ISQ values decreased from 75.4 to 73.8, and all patients were fully satisfied with the therapy. A post-hoc comparison between the outcome of laser-welded and cast frameworks showed that laser-welded frameworks were affected by significantly more complications (19 patients out of 46 and 6 patients out of 34, respectively; difference in proportion = 0.23, 95% CI: 0.03 to 0.43; Pearson's chi-square test, P = 0.032), therefore such a framework construction should be considered as a long-term temporary prosthesis and not a definitive prosthesis. Conclusions: Immediately loaded mandibular cross-arch prostheses can be supported by only two implants up to 5 years, if made with a robust cast framework. Longer follow-ups (around 10 years) are still needed to know the prognosis of this treatment modality. Purpose: To present ten cases of chronic post-surgical neuropathic pain (CPSP) arising after placement of maxillary dental implants, in order to raise awareness of this potential complication of treatment. Materials and methods: Data collected from the case notes of consecutive patients presenting to the orofacial pain clinic, with neuropathic pain arising after placement of maxillary dental implants. Results: Nine out of 10 patients were female, with an average age 55.4 years. Six patients had a significant medical history (depression, peripheral neuropathic pain, irritable bowel syndrome and fibromyalgia). Six patients had single implants placed, four had multiple implants. Four patients experienced pain during implant placement. Onset of pain was immediate in nine patients. Pain intensity (visual analogue scale) ranged from 2 to 9 (average 5.6). Pain was constant in all patients. Exacerbating factors included stress, tiredness, low mood and cold weather. Implants were removed in two patients however pain did not resolve. Pain management was complex; including medication (anti-epileptics and tricyclic antidepressants), Botox injections and cognitive behavioural therapy, however pain did not completely resolve in nine cases. Conclusions: Persistent pain after dental implant placement may occur with no apparent organic cause and without any neurosensory deficits. Practitioners must be aware of chronic post-surgical neuropathic pain as a possible complication of implant placement, particularly in patients with a significant medical history. Consideration should be given as to whether these patients are suitable for implant rehabilitation. Patients reporting very severe and prolonged postoperative pain following implant surgery should be considered at risk of CPSP and referred to a specialist in orofacial pain. Purpose: To report a rare presentation of an ameloblastoma mimicking an endo-periodontal lesion. Materials and methods: In this case report, we present the unusual clinical course of a 78-year-old Caucasian male patient, seeking single tooth implant rehabilitation at location 42 (lower right lateral incisor), initially unsuccessfully treated at different clinics for a persistent endo-periodontal lesion associated with this tooth, by both an endodontist and a periodontologist, which finally lead to tooth loss. Results: CBCT imaging of the anterior mandible region revealed a persistent radiolucency and subsequent enucleation of the lesion in the partially healed extraction socket revealed the true underlying diagnosis: a solid follicular ameloblastoma. A re-entry with biopsy was planned after radiological confirmation of lesion growth 1 year later, reconfirming the diagnosis and necessitating partial segment resection of the mandible. Conclusions: In the presence of lesions refractory to therapy, consideration towards a broader differential diagnosis and an appropriate investigation should be undertaken before the decision on implant placement.